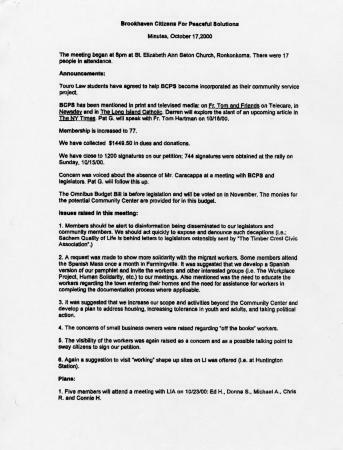 Brookhaven Citizens for Peaceful Solutions meeting minutes, Suffolk County, N.Y., October 17, 2000.;An influx of mostly Mexican immigrants, many believed to be undocumented, in Farmingville, New York in the the late 1990s rattled the small town and led to a rash of violence against day laborers. Several community groups, some advocating for immigrants, such as the Brookhaven Citizens for a Peaceful Solution, and some against their presence, such as the Sachem Quality of Life Organization, formed in response to the situation. Source: Hofstra University. Hispanic/Latino Collection, 1951-2008. Box 12, Folder 4.